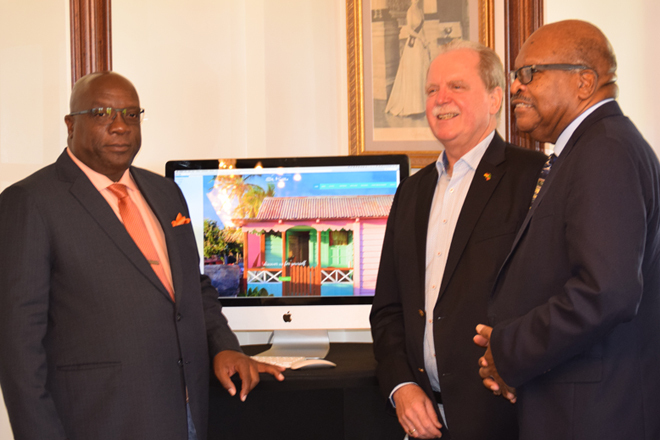 (SKNIS): The new website launched by the St. Kitts and Nevis National Archives can be seen as a launching of lasting memories and aspects of the Federation’s history utilizing technology, says Governor General, His Excellency Sir S.W. Tapley Seaton, GCMG, CVO, QC, JP. “I think it is very useful to have all this information and I think what Mrs. O’Flaherty has done through her tireless efforts will pay dividends in terms of our students being able to understand where they’ve come from, where they are and where they’re going,” said the governor general, speaking at the launching ceremony on May 25 at Government House. Sir Tapley especially commended Mrs. O’Flaherty for her hard work and dedication to the National Archives and to the website. “She has taken on the archives and has sought to transform them into something more meaningful than just a stale list of books and documents. She has brought them to life,” he said. The prime minister said that it was important to note that this digital technology brings the national records into quick and easy contact with students and teachers, tourists and prospective visitors, as well as people all around the world who want to trace their ancestry or research the history of the country. “So, I commend those who have created it for the fine job they have done,” he said. Prime Minister Harris thanked the Government of Germany, in particular His Excellency Ambassador Holger Wilfried Michael, with the consistency of its support to the agenda of the National Archives and national heritage. The Embassy of the Federal Republic of Germany in Port of Spain, Trinidad, contributed generously to the project. Its support made it possible for the National Archives to purchase a large flatbed scanner to be able to scan material, both for the website and for preservation purposes. Equally commended by the prime minister was the Director of the National Archives, Mrs. Victoria O’Flaherty, and her staff for reaching this milestone. Praises were also given to Genesis Creatives, the local web developer that designed the site. “This is a good start for us in St. Kitts and Nevis in taking note of our history of recording the elements of our national heritage,” said the prime minister, noting that it is a task that cannot be left alone in the National Archives.